Attention all shoppers - Australia’s popular online shopping destination for babies and kids goods can be seen in real life from 30 June to 2 August, with a special TiniTrader shopping event in Fitzroy, Melbourne. 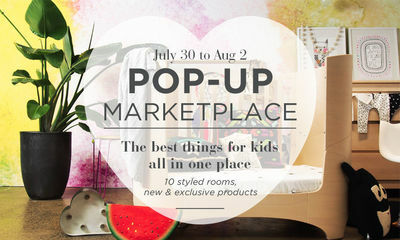 Called the TiniTrader Pop-Up Marketplace, shoppers will be able to browse beautifully curated spaces that showcase the best in children's interior styling ideas and products from more than 200 retailers. Everything on display will be available for sale such as beds, bedding, clothing, prams, toys, rugs and everything in between. If you see something you like, you can buy it. It doesn't end there - TiniTrader will host some extra activities over the four day period including: an indulgent champagne bar on Friday evening, styling tips with well-known children’s interior designer Jacinda Malloy from Hide & Sleep on Saturday, and a meet and greet with Tizzie Hall on the Sunday. TiniTrader offers a one-stop-shop for busy parents, with more than 30,000 kids products available from hundreds of retail stores. The TiniTrader Pop-Up Marketplace has been developed in conjunction with sponsors including Bugaboo, Gro Company, Lilly & Lolly and Maggie Beer. Pre-register at tinitrader.com.au HERE to receive your Tinitrader Pop Up Marketplace Show Bag, and go into the draw to win one of five great prizes.